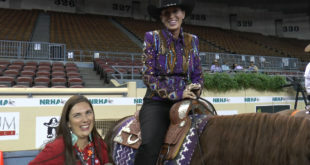 Susie Dunn won the APHA Youth in Saturday’s ancillary action. 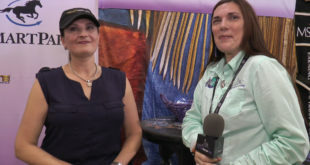 Check out Susie’s interview! 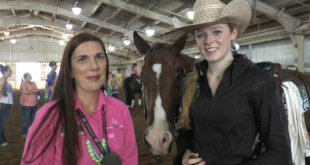 Madeline Bomba won the APHA Solid Youth, and was Co-Champion in the 14 – 18 Youth and Unrestricted Youth in Saturday’s youth ancillary action. Check out Madeline’s interview! 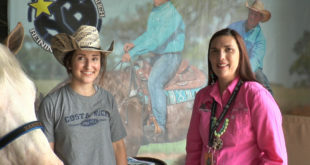 Emma Lane was crowned Co-Champion in the Youth 14-18 and the Unrestricted Youth in Sarutday’s youth ancillary action. Check out Emma’s interview! 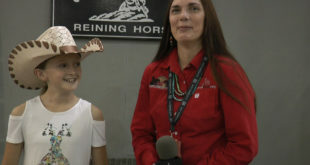 Becca Schaffhauser won the 10 & Under Short Stirrup in Saturday’s youth ancillary action! Check out Becca’s interview! 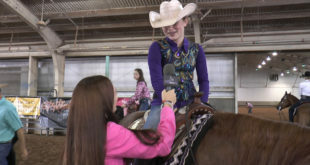 Addyson Schmersal won the 13 & Under Youth in Saturday’s youth ancillary classes. 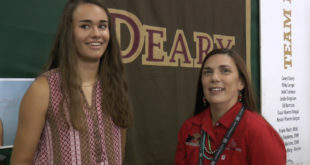 Check out Addyson’s interview! 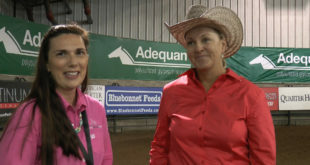 After a runoff in the Non Pro Derby Finals, Sandra Bentien slid into the championships with a whopping 224! Check out Sandra’s interview! 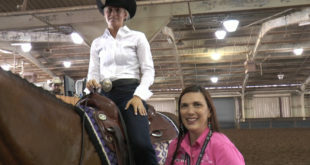 Jenanne Overgaard almost swept the Non Pro Derby by winning the Prime Time, Level 1 and Level 2! 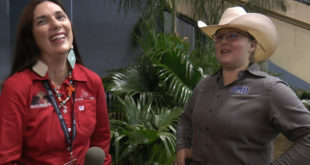 Check out Jenanne’s interview! 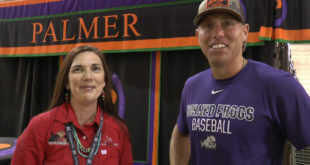 Rick Christen won the Masters Non Pro Derby during Friday’s derby. 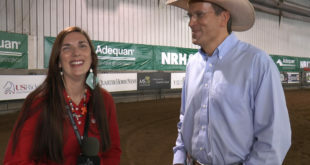 Check out Rick’s interview! 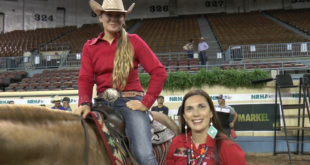 Emily Opell won the Youth Non Pro Championship in Friday’s Non Pro Derby action! Check out Emily’s interview! Tristan Bagby won the Rookie Levels 1 and 2 in today’s ancillary action! Check out Tristan’s interview! 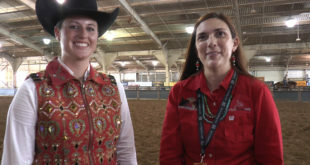 Madison Steed won the Collegiate Championships today at the NRHA Derby. Check out Madison’s interview! 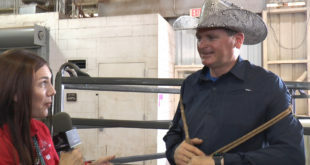 Terry Saxton won the Prime Time Rookie in Friday’s ancillary action, despite having food poisoning earlier in the day! 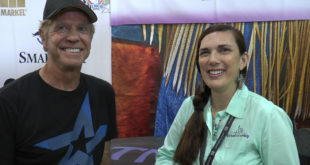 Check out Terry’s interview! 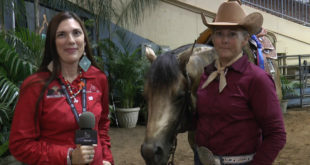 Mindy Davis won the USA Para Reining Grade 1 in today’s ancillary classes. Check out Mindy’s interview! Matt Gomulak won the Green Reiner 1 in Friday’s ancillary action! Check out Matt’s interview! 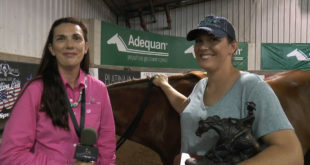 Dana Pastorino won the Green Reiner 2 in Friday’s ancillary action! 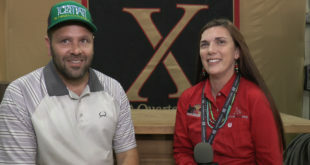 Check out Dana’s interview! Brad Giesbrecht won the Novice Horse Open Level 1 in Thursday’s ancillary action! 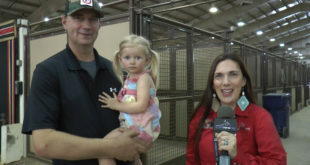 Check out Brad’s interview, along with daughter, Ava! Sam Schaffhauser won the Novice Horse Open Level 2 in Thursday’s ancillary action! Check out Sam’s interview! 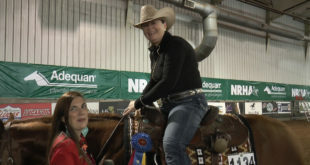 Mandy McCutcheon won the Novice Horse Non Pro Levels 1 and 2 in Thursday’s ancillary action. 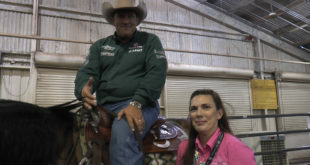 Check out Mandy’s interview. 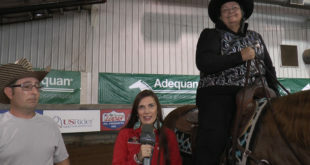 Greg Hall won the Prime Time Non Pro in the ancillary action on Wednesday. Check out Greg’s interview! 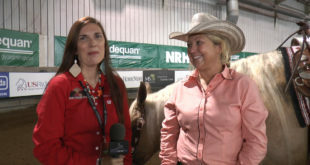 Cathy Brant won the $2,000-Added Intermediate Non Pro in the ancillary action on Wednesday. Check out Cathy’s interview! 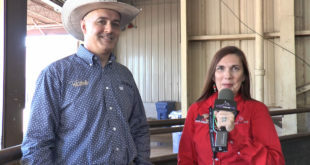 Thiago Bochat won the AQHA in the ancillary action on Saturday. Check out Thiago’s interview! 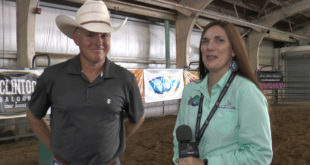 Adam Johnson won the Co-Championship in the Intermediate Oped during the ancillary classes on Monday. Check out Adam’s interview. 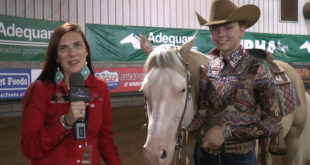 Charley Thiel won the AQHA Amateur class Tuesday. Check out Charley’s interview! 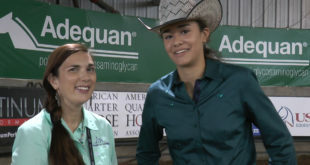 Sydney Nesky won the Limited Open and Rookie Professional in Monday’s ancillary action. 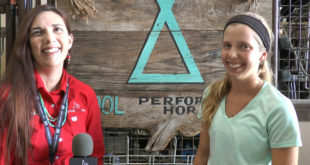 Check out Sydney’s interview. Sean Pulley was the Co-Champion in the Intermediate Open in Monday’s ancillary action and he won the Novice Horse Open Level 1 in today’s ancillary action. There was a three-way tie in the Limited Non Pro on Monday. Madison (Mattie) Gustin was one of the three. 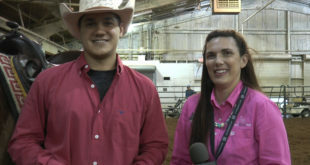 Check out Mattie’s interview. 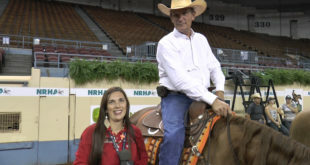 Matt Palmer won the USA Reining during Sunday’s ancillary action. Check out Matt’s interview! Madison Rafacz was one of the three co-champions in the Limited Non Pro during Monday’s ancillary action! Check out Madison’s interview! Cody Sapergia won the Intermediate Open in Sunday’s ancillary action! 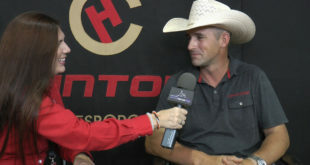 Check out Cody’s interview. Lynda Weaver won the Novice Horse Non Pro Level 1 in the ancillary action on Sunday. 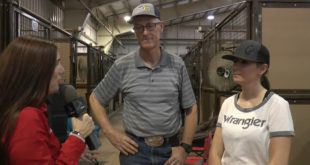 Check out Lynda’s interview! Eduardo Giannasi won the Limited Open and the Rookie Professional in today’s ancillary action! Check out Eduardo’s interview! Shawn Flarida won the Open in today’s ancillary action. Check out Shawn’s interview! 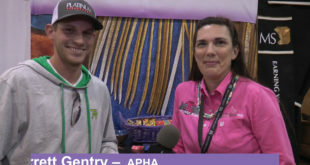 Garrett Gentry won the APHA Open in Saturday’s ancillary action. Check out Garrett’s interview! 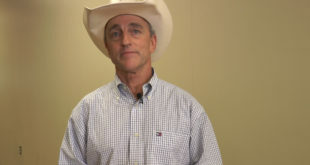 Morris Kulmer rounded out the first class in ancillary action in the Prime Time Non Pro. Check out Morris’ interview! 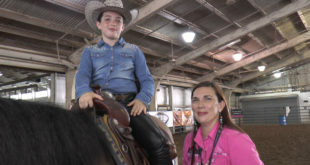 Mattie Gustin won the Non Pro, Intermediate Non Pro and Limited Non Pro in the first class of the ancillary action at the NRHA Derby. 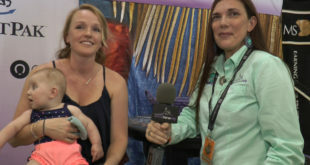 Check out Mattie’s interview!